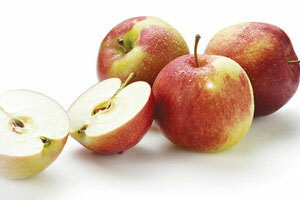 Ontario Northern Spy Apples are hard to beat in this recipe. However, you may use Ontario Spartans, Idareds, Cortlands, Crispins (Mutsu), Golden Delicious and Empire Apples which all hold their shape when baked. They vary in sweetness, so adjust amount of sugar accordingly. In large bowl, combine flour and salt. Cut in lard with pastry blender or 2 knives until mixture resembles coarse meal. In a 1 cup (250 mL) glass measure, combine vinegar and egg. Add enough water to make 1 cup (250 mL). Gradually stir liquid into flour mixture, adding only enough liquid to make dough cling together. Gather into a ball and divide into 6 portions. Wrap and freeze or refrigerate unused portions. Roll out a portion on a lightly floured surface. If dough is sticking, refrigerate 1 to 2 hours. Fit pastry into a 9-inch (23 cm) pie plate. Trim edge, leaving a 1/2-inch (1 cm) overhang. Combine sugar, flour, cinnamon and nutmeg and toss with apple slices. Place filling in pie shell and dot with butter or margarine. Roll out another portion of pastry and place over filling. Trim top edge of crust, leaving a 1/2-inch (1 cm) overhang. Tuck overhang under bottom edge of the crust. Press together and flute edge. Cut several slashes as steam vents in top crust. Bake in preheated 425°F (220°C) oven for 15 minutes. Reduce heat to 350°F (180°C) and continue baking for 35 to 45 minutes or until fruit is tender and pastry is golden brown.